At the beginning of April, I shared with you the kit that I was making these fan blades from. They were poorly designed and I found that I had to recut all 264 fan blades. They are now all recut and mostly sewn together. Yippee. Shown at the right of the photo are all the trimmings. I never did hear back from QuiltKing even though I sent them two emails of inquiry. I will never recommend them to anyone, so if you go to Kentucky for a quilting event, don't waste your money on a kit from them. There won't be any further updates on these fans until I get some tops made. I have 44 fans, so that should make several baby quilts. I do have other projects to share with you in the mean time. At my local quilt shop, I am doing the Saturday morning sampler. WE are using a pattern called Building Blocks designed by Sharyn Craig. I wrote more about the project in this post. This is the block for month 3. I was really bad and didn't do my homework until the night before class. This month i was really good and did it the next day. For month 4 I decided to piece 2 blocks. They look very different. I have decided on a setting for them and am using a pattern by Judy Martin, from her book Knockout Blocks and Sampler Quilts, the pattern is called "All in the Family Sampler". These blocks are all 9 inches finished. I'll need 21 in this size. I also need 68 smaller setting blocks. These will measure 4 1/2 inches finished. Two down. Fortunately they all have the same size corner piecs and outer triangles. These I can cut in bulk. The inner pieces seem to all be similar sizes, so i can pre-cut some of those and share them around. I'll keep working on these little onesand slowly I'll get them finished about the same time I finish the class. The entire quilt should measure about 78 inches square. This week I am hoping to spend some time machine quilt. I have some single blocks that will work for mug matts. They should be the perfect practice pieces. I don't have a problem with quilting my quilts, but i don't like marking. I need practice with non-marked patterns. This is one of my goals for the year, and my other is set in or y-seams. My first attempt at those has been the borders on my mystery quilt. Only once before have I used mitred corners on a border. This one calls for two rows of them. I'll have pics of that quilt later in June. Since it's a mystery, there are several guilds working on it and I don't want to spoil the surprise. 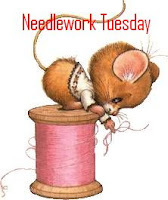 I am wondering whether you set yourself learning goals with regard to your needlework? I know that we all set goals to finish projects, but how about for learning new skills or for polishing existing one? Not all weeks result in miles of stitching. Some weeks we each need to attend to those other matters that make up our families and lives. Tami, as Just One More Thing was working on her sewing area as well as a banner holder. On Sunday, she also wrote a nice post on how her family ended up where they are. We seem to be on a theme here. Rikki at Rikki's Teleidoscope has been working on her room as well, though this is an outdoor one. It's going to be most inviting when done. Beautiful blocks, as always. And thanks for the mention. Yes, I am trying to set goals. I am a novice quilter and have stuck, for the most part, to simple blocks with large pieces. I want to advance to making more intricate, detailed pieces. And full size quilts rather than wall-hanging or throw size. I am scheming a wedding quilt for my son and fiance but am nervous to pull the trigger and buy the fabric. It's a big financial and time investment for me - but I've got a year to get it done. Time to take the plunge! Nice blocks, Heather. I especially like the pink/black/cream/gold one (3rd photo). Aaarrrgghhh, I can feel your pain with a poorly produced kit! With 264 of them it must have seemed to go on forever. I have some vintage fans I need to make into a quilt, many still need the curved corner added. It is on my "to do" list! I really like that pink & black? block it's really eye-catching. Well my needle work is knitting. I don't set goals to learn something per se, but I do like projects that are constructed differently. Or projects that I fiddle with to make them work for me. It's hardly ever straight out of the box with the pattern for me. I think challenging yourself keeps our crafting fresh. Great squares and sorry the fans turned out to be a hot mess. That is a very ambitious sampler project! Not so much setting goals in regards to needlework, but I am always on the lookout for new projects - and sometimes even finish one of them. Two years ago I wanted to learn how to sew properly. but honestly sewing is just not for me. No point in desperately trying to learn something when you know that it is just not your thing. I would be so disheartened to have to re-cut that many pieces. I don't know if I'd have it in me to actually do it. Good for you!